« State sanctioned theft of mineral rights? In most years, the dark clouds over the Texas Panhandle in the spring means rain. This year, they’re more likely be an indicator of wildfires which have already burned thousands of acres in March as the state stares once again into the face of a severe drought. Our neighbor, Oklahoma was drier in December, January, February and March than it has been in any similar period since 1921. That’s saying a lot in the state known for the 1930s Dust Bowl, when drought, destructive farming practices and high winds generated severe dust storms that stripped the land of its topsoil. The drought stretches from the Louisiana Gulf coast to Colorado, and conditions are getting worse, according to the U.S. Drought Monitor. 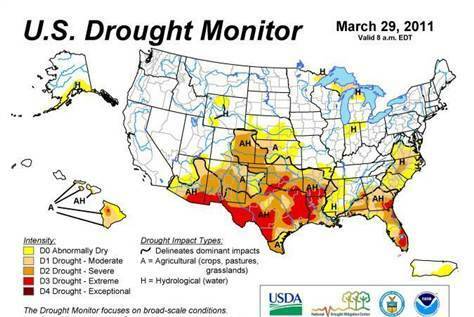 The area in Texas covered by an extreme drought has tripled in the past month to 40 percent. A daunting prospect for a state that was just starting to recover from our last drought. Drought indicators in east-central Texas puts the region in the Exceptional Drought (D4) level, and if rain does not materialize soon, intensification of the current drought is likely. And the drought regions in northern and central Texas continued to depict worsening conditions as well, as the lingering benefits of scant late-winter rainfall gives way to dry, hot weather. An extreme drought is declared when there’s major damage to crops or pasture and widespread water shortages or restrictions. Weather forecasters expect the drought in Texas to continue or get worse through June in most of the state with the danger of fire remaining extremely high according to the National Weather Service. They are also warning that this could be one of the more devastating droughts on record if the state doesn’t start getting normal to above normal rainfall before June. According to the state climatologist, John Nielsen-Gammon, Texas hasn’t had a drier October to February period since 1967. The five months that ended Feb. 28 saw only 4.8 inches of rain on average across the state. In a typical year, an average of 9.7 inches would fall. As examples, Midland got .1 inches of rain in March, while College Station got 6 inches. Usually, those cities would get 4.6 and 19.1 inches respectively. The drought has been made worse by warmer than normal temperatures. This past Sunday, low humidity and winds up to 55 mph fueled the spread of wildfires across West Texas, and four big ones burned more than 11,000 acres. Currently nearly 180 of Texas’ 254 counties have burn bans. While the state fights the EPA tooth and nail over the regulation of greenhouse gasses, Texans get to see first-hand, the impacts of climate change on our daily lives. It’s going to be a long hot summer folks.